Hi. I’m Jen. Still. Tommy and I have a list of things we really loved about being in Samoa. While this list isn’t complete, it gives you an idea of some of the fun things we’ve encountered in our short time here. Some other things that don't show up below but are still awesome are fish and chips, sunsets, friendly Samoans, the clean air, Scout the cat, the noises that lizards make, mosquito nets, and highway landscaping. 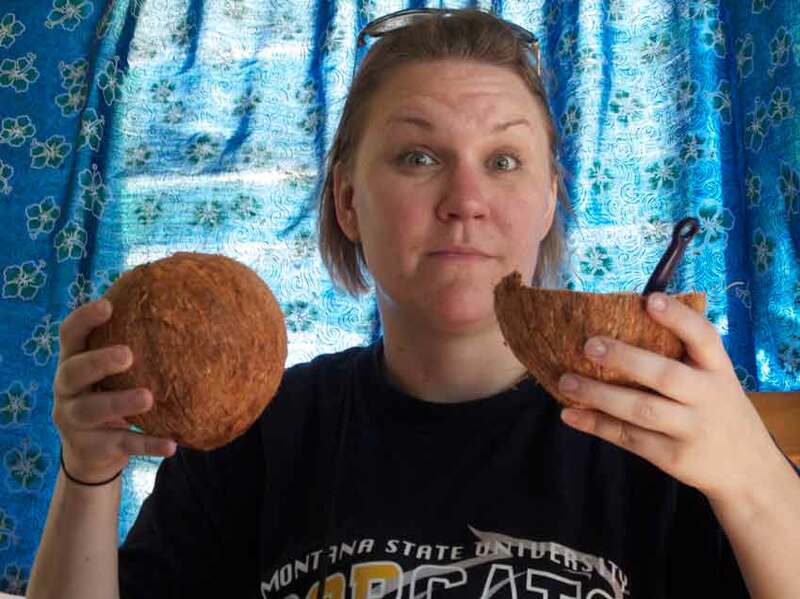 Drinking from coconuts. Niu, as the drinkable coconuts are called, are delicious. I do NOT like dried/shredded coconut at home, so I was skeptical of this practice. Thankfully I gave it a chance. It’s light, refreshing, and a little bubbly. Also, Scout the cat seems really excited about getting into a coconut, which is both cute and entertaining. Walking. I really like that most places in Apia are within walking distance. I would prefer the walking be done with a breeze and in the shade, but I like it nonetheless. You get a better opportunity to take in the environment from your feet than from a car window. The buses. This was one of the biggest surprises for me. As a faithful blog reader, I had a pretty good idea about a lot of things to expect here in Samoa. The buses, however, were a hilarious surprise. They have the most random murals and funny sayings on them. We didn’t get a picture of this one, but it says “Jungle Boys” across the side with a picture of Mickey Mouse holding a Digicel phone (a local cell phone company). On the back there’s a mural of Scar and Simba with the words “No More Hate”. It doesn’t get more awesome than that, but I’m going to keep going. Tanu Beach. 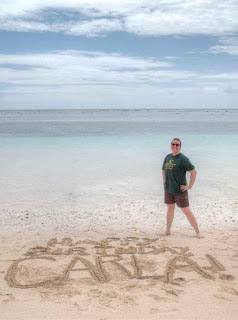 Savai’i is beautiful and we were lucky enough to experience it at the Tanu Beach Fales. There’s something to be said for falling asleep to the sound of waves crashing and taking a walk along the beach minutes after waking up in the morning. 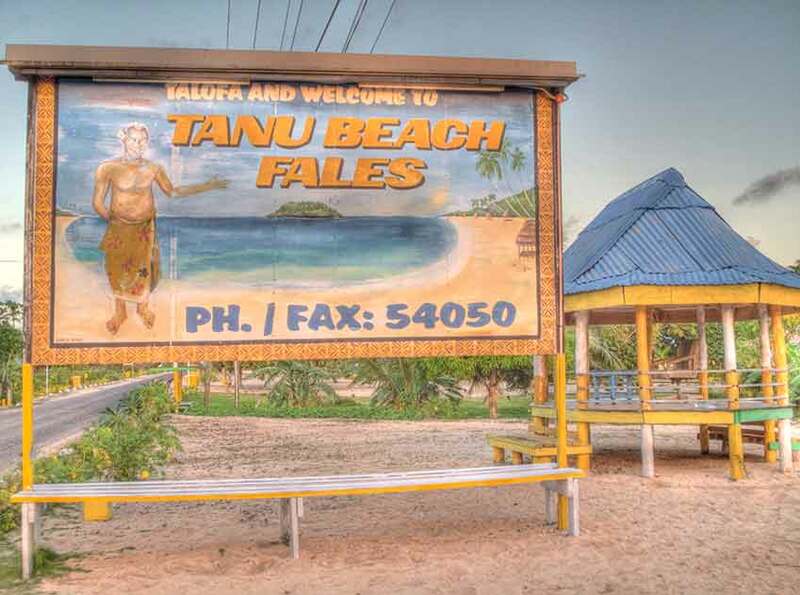 Tanu Beach Fales is run by a family and they extend that family atmosphere to their guests. Breakfast and dinner are served on a long U-shaped table and the cultural show on Saturday night is put on by the entire family, from babies to grandpa. 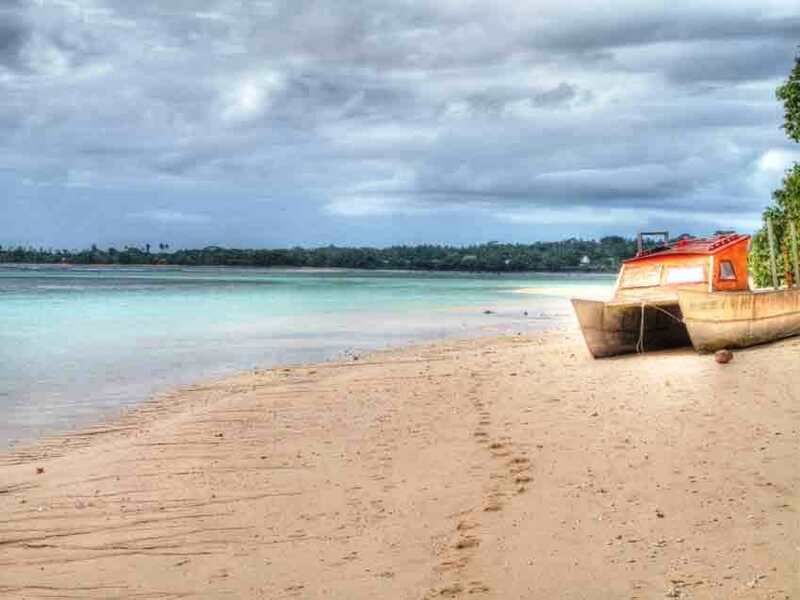 It’s relaxing, the ocean water is the perfect temperature, and the scenery is postcard-esque. Breakfast foods. Both at Apia Central, where we stayed in Apia, and at Tanu, breakfast was provided. It turns out I’m not papaya’s biggest fan. 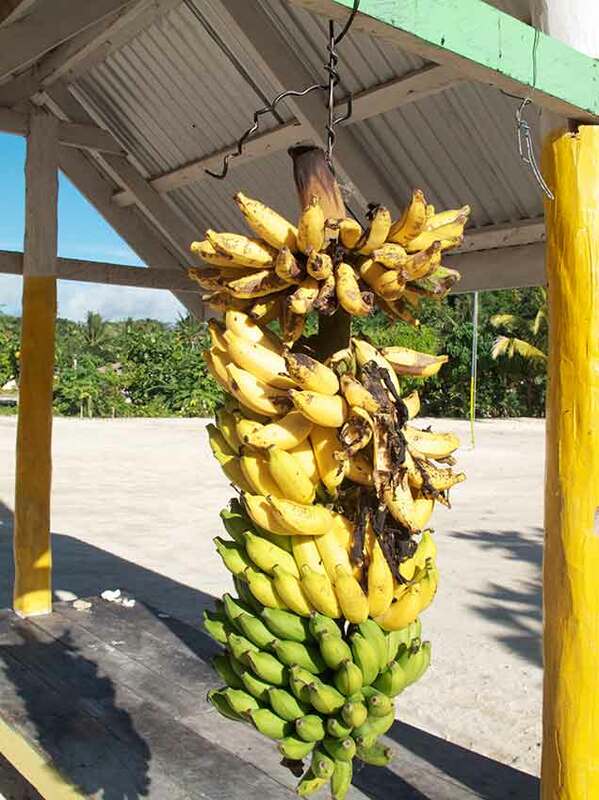 However, I am a fan of New Zealand butter on toast, miniature bananas, and mangoes fresh from the tree. Tommy insists I also write a sentence about the panikeke, which is much like a banana flavored cake-donut hole. Besides Seki ā Pizza, it was his favorite food experience here so far. Seki ā Pizza. A four-village walk from Tanu Beach Fales brings you to the best pizza I’ve had in a long time. The crust was thin and flakey and the sauce was perfectly seasoned. Not only was the pizza delicious, but the owner, Andy from Austria, gave us a lift back to Tanu. 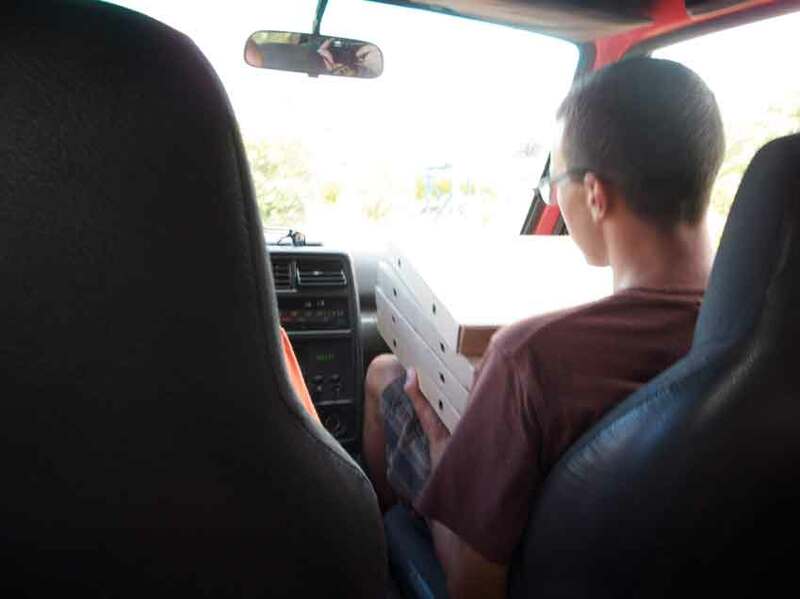 Matthew rode shotgun with the pizzas that needed delivering. 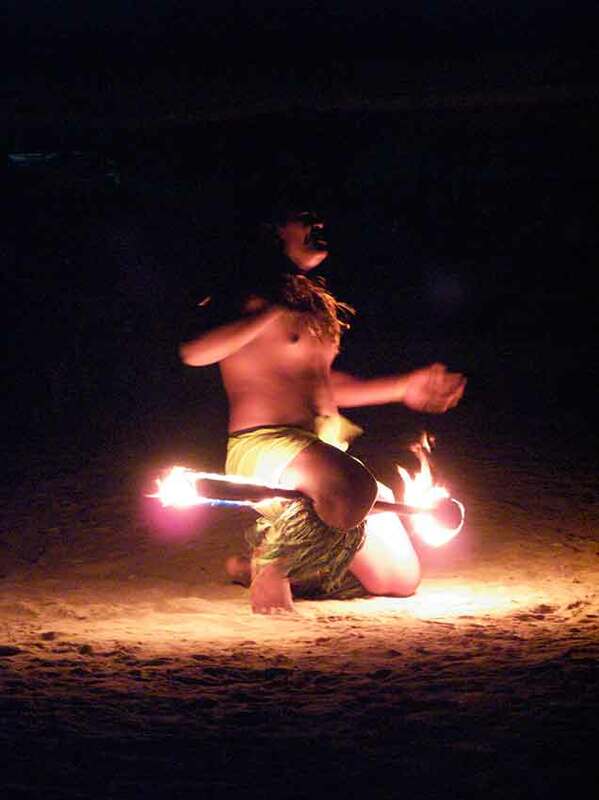 Fire Dancers. As I mentioned above, there was a cultural show at Tanu on Saturday night. At first this reminded me of a Logan cultural assembly. They danced and sang after feeding us a traditional Samoan dinner (also delicious, by the way). It was nice to see the entire family participate, including the very young children and to experience traditional songs and dances. Being the Logan alumni that we are, we assumed there would be a fire component to the show. We were not disappointed. These boys have been practicing their craft since the age of 5 and it shows. The pictures don’t do any of them justice, of course, but we had to include one. 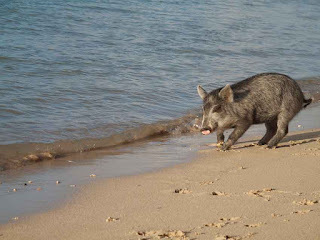 Beach pigs and other animals. I knew from some of Matt’s Cultural Explorations there would be a fair number of animals roaming around. Maybe it’s the city mouse in me, but for some reason I find them fascinating. At Tanu they have a pet pig (which is probably more likely an eventual dinner than an actual pet), which one of the Kiwi’s started calling “Xena the Warrior Pig” because she was friendly to the women and bit the men. She had a number of incidents with some of the men while we were there. She also had free reign of the place and found herself on the beach a number of times. 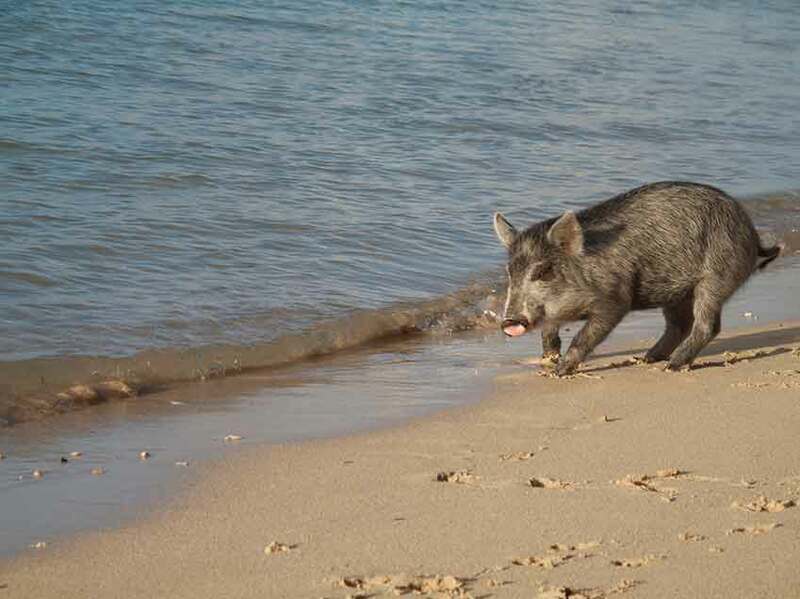 A pig on the beach? Fantastic. Of course getting to spend time with Matthew and his Peace Corps friends was the main highlight of the trip (minus the brutality during Friday’s soccer match). After reading about them for so long it was nice to get to meet and hang out with everyone. We’re off to Australia now, where we’ll need long pants and raincoats. Thanks to Matthew for hosting us and thanks to you for reading. I hope you’re well! Pictures below. THis is just one of many different murals painted on the sides and backs of the buses. Tanu is awesome... glad to see you had a great time! That piggy would not be safe with me on the beach today, cause I'm in the mood for roast pork, yams and a good bottle of cabernet sauvignon. hahaha!! 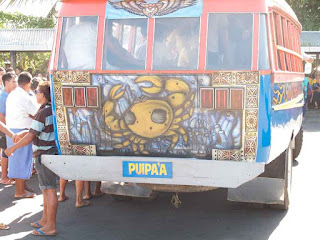 Jungle Boys Bus is actually from my village of Fasitoo. Glad you got a good kick out of that one. I miss my village but its also hard for me to leave the South Bay. Great blog Jen.